As the title states. What's the difference between the two? digitalWrite will set the specified pin to one of two states - HIGH/LOW, which equate to 5v (3.3v on some boards) and ground respectively. analogWrite can vary by the type of output used. 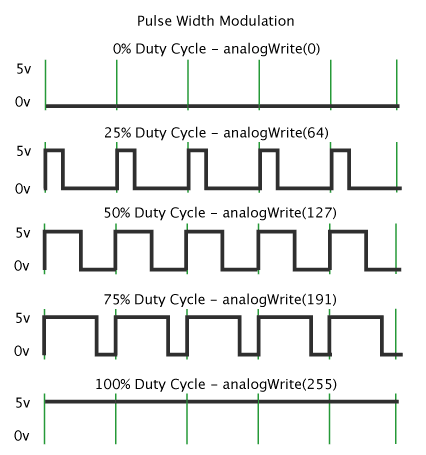 analogWrite(): The analogWrite() method sets the value of a PWM output pin. The analogWrite() is on a scale of 0 - 255, such that analogWrite(255) requests a 100% duty cycle (always on), and analogWrite(127) is a 50% duty cycle (on half the time). pin: the PWM output pin number. digitalWrite: The digitalWrite() method sets the value of a digital pin as HIGH or LOW. Here, 5V (or 3.3V on 3.3V boards) for HIGH, 0V (ground) for LOW. 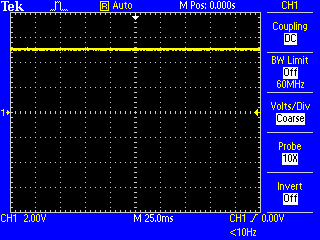 digitalWrite sets the output pin to either LOW or HIGH (where those voltages depend on the Vcc of the processor. For a Uno or Mega that would be 0V or 5V (or close to it). 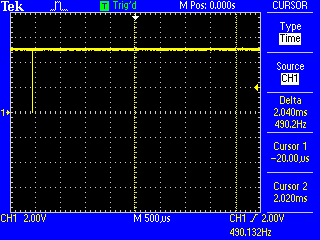 That is, the output pin is at 0V. The output voltage is 5V. analogWrite really should have been named PWMwrite since it configures the processor timers to output PWM (pulse-width modulation). 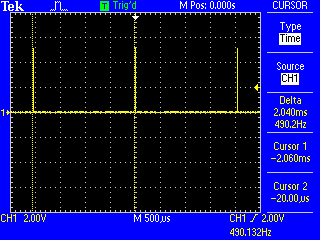 You can see that the voltage level is 0V most of the time, and going to 5V for short periods. You also see that the frequency is 490 Hz which is what the reference page for analogWrite says it will be. The output is high for 8 µs, which is exactly 1/256 of 2048 µs which is the period of the timer. So, we have a duty cycle of 1/256 (0.39%). Now you can see that the output is HIGH exactly half the time, and LOW the rest of the time. 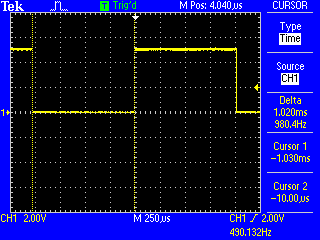 Now the output is off for 8 µs - compared to the earlier image where it was on for 8 µs. analogWrite (0) is the same as digitalWrite (LOW). analogWrite (255) is the same as digitalWrite (HIGH). analogWrite basically configures the hardware timers to output PWM. 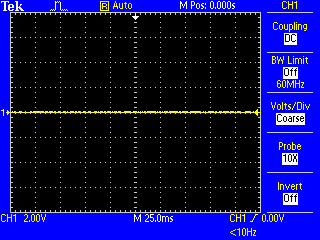 Once you do that the timer hardware outputs the requested duty cycle (from 0 to 255) where 0 is always off, 255 is always on, and some value inbetween gives you PWM (pulsed output). For more information about the timers see my page about timers. digitalWrite sets the pin to an high or low value that remains at exactly that value until digitalWrite is called for that pin again. analogWrite sets the pin to have an oscillating value which has a pulse length based of the duty cycle specified as the second parameter. analogWrite (6, 127);      // Pin 6 oscillates regularly between 0v and 5v (or 3.3v) at about 250Hz. 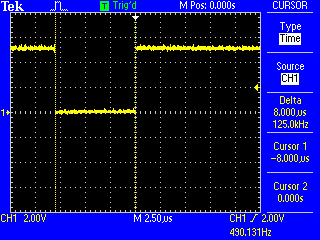 analogWrite(): Writes an analog value (PWM wave) to a pin. Can be used to light a LED at varying brightnesses or drive a motor at various speeds. After a call to analogWrite(), the pin will generate a steady square wave of the specified duty cycle until the next call to analogWrite() (or a call to digitalRead() or digitalWrite() on the same pin). 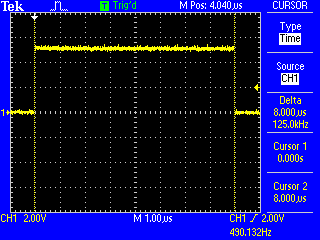 The frequency of the PWM signal on most pins is approximately 490 Hz. On the Uno and similar boards, pins 5 and 6 have a frequency of approximately 980 Hz. Pins 3 and 11 on the Leonardo also run at 980 Hz. analogRead(): Reads the value from the specified analog pin. The Arduino board contains a 6 channel (8 channels on the Mini and Nano, 16 on the Mega), 10-bit analog to digital converter. This means that it will map input voltages between 0 and 5 volts into integer values between 0 and 1023. This yields a resolution between readings of: 5 volts / 1024 units or, .0049 volts (4.9 mV) per unit. The input range and resolution can be changed using analogReference(). It will set the pin to a periodic high/low signal. So what's the difference between analogWrite(X, 255) and digitalWrite(X, HIGH)? Probably nothing, except perhaps the processor has to do some extra stuff to work out that it doesn't need to use PWM, and also style. Not the answer you're looking for? Browse other questions tagged digital analogwrite or ask your own question.